The final trailer’s so packed with new clues teasing what’s in store for Stranger Things season two, you’ll need to watch it multiple times to catch everything it unveils. Netflix is set to launch every episode of Stranger Things season two on October 27, 2017, timed so that fans can fill their Halloween weekends binge-watching the critically acclaimed series. 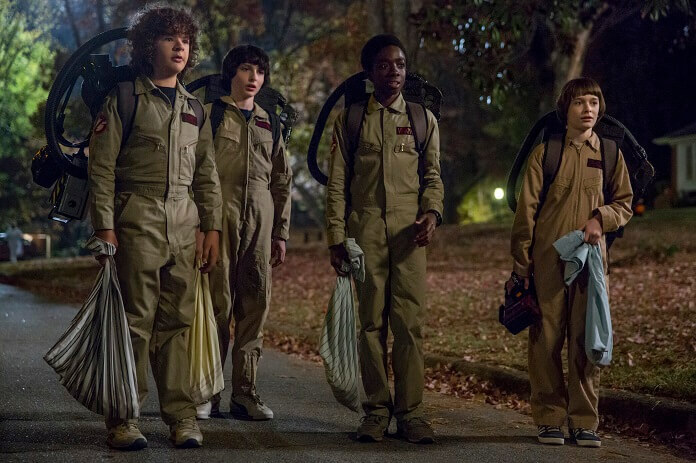 The season two cast includes David Harbour (Police Chief Jim Hopper), Winona Ryder (Joyce Byers), Charlie Heaton (Jonathan Byers), Natalia Dyer (Nancy Wheeler), Millie Bobby Brown (Eleven), Finn Wolfhard (Mike Wheeler), Caleb McLaughlin (Lucas Sinclair), Gaten Matarazzo (Dustin Henderson), Joe Keery (Steve), Cara Buono (Karen Wheeler), Dacre Montgomery (Billy), Shannon Purser (Barb), Sean Astin (Bob Newby), and Paul Reiser (Dr. Owens). Stranger Things Plot: A love letter to the ’80s classics that captivated a generation, Stranger Things is set in 1983 Indiana, where a young boy vanishes into thin air. As friends, family and local police search for answers, they are drawn into an extraordinary mystery involving top-secret government experiments, terrifying supernatural forces and one very strange little girl. And the Stranger Things Season 2 Plot: It’s 1984 and the citizens of Hawkins, Indiana are still reeling from the horrors of the Demogorgon and the secrets of Hawkins Lab. Will Byers has been rescued from the Upside Down but a bigger, sinister entity still threatens those who survived.